In this epic of imagination, time travel, and adventure, Diana Gabaldon continues the riveting story begun in Outlander. Jamie Fraser is an eighteenth-century Highlander, an ex-Jacobite traitor, and a reluctant rebel in the American Revolution. His wife, Claire Randall Fraser, is a surgeon—from the twentieth century. What she knows of the future compels him to fight. What she doesn’t know may kill them both.With one foot in America and one foot in Scotland, Jamie and Claire’s adventure spans the Revolution, from sea battles to printshops, as their paths cross with historical figures from Benjamin Franklin to Benedict Arnold. Meanwhile, in the relative safety of the twentieth century, their daughter, Brianna, and her husband experience the unfolding drama of the Revolutionary War through Claire’s letters. 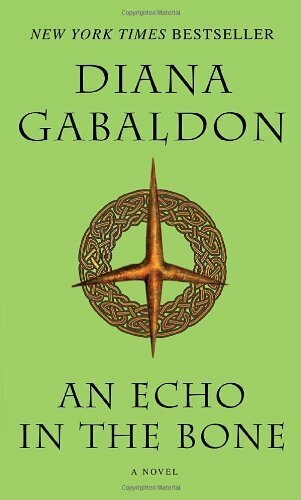 But the letters can’t warn them of the threat that’s rising out of the past to overshadow their family.Diana Gabaldon’s sweeping Outlander saga reaches new heights in An Echo in the Bone.